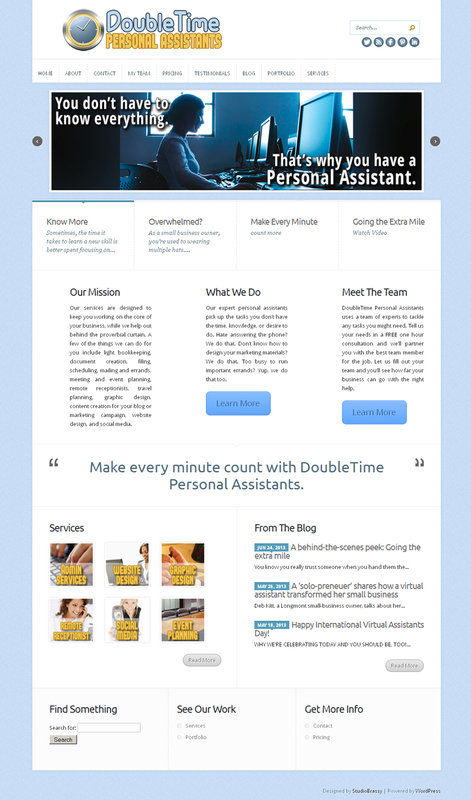 During the summer of 2013, I designed and implemented a rebranding project for Kelli Girl Friday (now DoubleTime Personal Assistants) with coordinated website design. Work on these projects included brand identity, marketing materials, website installation and customization (CSS, PHP, HTML, and custom graphics). Website design is based on a premium WordPress Theme that allows easy end-­user content management. WordPress is highly customizable, stable, and functional. As a non­proprietary Content Management System, it’s also easier for clients to find reasonable webmasters to hire for future work if desired. Key website functions included dynamic XML sitemapping, caching for improved site performance, business dashboard to improve the client’s experience using the website, social media automatic cross-­posting capabilities, set­up for improved SEO function, a blog, featured video and photo slider, and relevant page and category set­ups. The screenshot below links to the current active website. I maintain the site and make design evolutions as needed, so feel free to visit DTPA and click around. Of course, I also highly recommend them if you need a personal or virtual assistant, since they are such a wonderful client to work for!